While there cannot be any question as to the excitement level generated by one Javier Baez, there are certainly polarizing elements of his makeup and skill set as a major league player. A free-swinging, flashy fielder is going to draw the ire of some in the baseball community, and the reaction after his recent slide into second base in which he was injured and held out of game action for a short period of time is yet another example of such ire. Social media was riddled with folks who condemned the head-first slide that led to the injury. That idea, in a lot of ways, makes plenty of sense. We’ve seen players suffer freak injuries stemming from head-first slides over the course of the last several years. It cost Mike Trout time this year, and there was also a scare with Kris Bryant. The less rational takes involved Baez changing his game in order to serve the betterment of the team, wherein he eases up on the throttle in order to avoid injury in the future. There are a few things wrong about that sort of idea. And it’s not unlike the complaints that we heard about Bryce Harper early in his career, back when he lost a battle with the right field wall back in 2013. The primary issue here, though, is that the type of thinking that involves Baez changing his name for the betterment of the team implies that he was being selfish in committing to a head-first slide, rather than making a split-second decision in a game situation. Standing by the idea that players, in general, should seek to avoid head-first slides in the future isn’t an absurd thought by any measure. In fact, from a health perspective, it’s probably one that most would tend to agree with. Even a perfectly executed slide could result in a freak finger, thumb, wrist, or even shoulder injury. This isn’t the first time that we’ve heard complaints about Baez needing to change the way he plays the game, though. And those criticisms aren’t limited to his play on the basepaths, either. 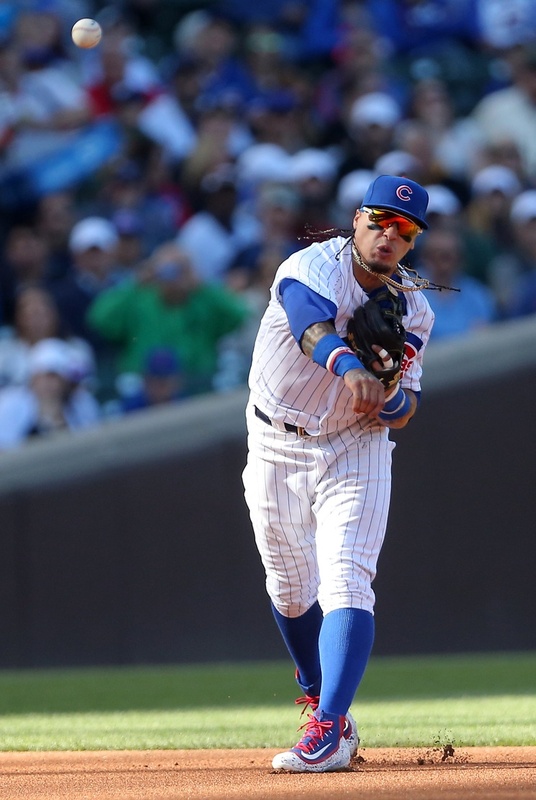 Since his debut, we’ve heard constant criticism of the erratic play that Javy Baez has a penchant for demonstrating. This is true in the case of his approach at the plate and his play in the field, as well as the more recent remarks about what he does on the basepaths. His aggressive, free-swinging ways were a point of contention early on, while his flamboyant style in the field has been targeted due to a potential lack of consistency in both glove and arm accuracy. But at no point has an overhaul been necessary for Javier Baez. His skill set and the style with which he plays the game of baseball are part of what makes him such an astoundingly intriguing entity. Every single player in Major League Baseball has some sort of shortcoming. The players that can overcome those deficiencies with what they do well are the ones that emerge as the elite level types. While we can’t point to Baez and call him an elite player in a general sense, there are elite tools, to be sure. And we’ve seen a lot of refinement within those tools, which indicates that a total change in his playing style isn’t necessary; it’s just refinement that might be needed. And in many cases, we’ve already seen such refinement take place. Baez has honed in those free-swinging ways on some level. In his first big league action, he struck out over 40 percent of the time, while he’s spent the last two years averaging in the mid-20s. It’s obviously still not a favorable percentage, but he’s cut down on punchouts, raised his walk rate (5.8 percent is his highest since his first appearance in 2014), and had a gradually increasing contact rate prior to this year. The bottom line is that there’s been refinement in his approach. Even then, there are going to be issues with strikeouts and the like. It’s a matter of looking the .212 ISO and TAv over .270 in each of the last two seasons as an ability to compensate for those shortcomings in the approach. In the field, many have taken issue with his supposed mental lapses, both with the glove and with his arm, in addition to his overall style. Sure, he has five throwing errors from the shortstop position, but that’s also likely not his long-term position, and it could be somewhat related to the fact that he bounces around. But to attribute that to the way he plays the infield would be incorrect. His flashiness is more of a byproduct of his insanely fast hands and his instincts. There’s an element of arrogance there, for sure, but if we’re talking about taking the good with the bad, let’s talk about the 56 out of zone plays that Baez has made at both middle infield positions combined, according to FanGraphs. The versatility, and subsequent competency all over the infield, compensates for any shortcomings there. Which allows us to circle back to baserunning. We’ve seen Baez steal home twice in the last calendar year. His BRR this year is 4.0, which easily tops the Cubs and ranks 16th among all position players in baseball. His aggressiveness and his instincts on the bases are what make him such a significant threat. There’s absolutely no reason to change that. An injury risk is one that any player takes any time they step out onto the field. Would you like to see him commit to fewer head-first slides in order to avoid a potential upper-body injury? Sure, but those head-first slides have also made him effective in his ability to avoid tags on such slides. Perhaps it’s just a matter of picking his spots more efficiently in order to avoid putting himself into situations where he could put himself at risk of injury. Maybe that’s the refinement that’s necessary. The overall bottom line in regard to Javy Baez is this: the erraticism within his game is always going to exist, no matter what facet of the game we’re talking about. He’s going to have shortcomings in the field, on the basepaths, and at the plate. What Baez has been able to do, though, is refine each element in order to allow for him to more than compensate for those shortcomings. As long as he continues to focus on those small developments, without overhauling and potentially derailing a particular aspect of his game, then there’s no reason for him to change the way he’s playing the game. That implies that there’s something wrong with how he’s performing, and that simply isn’t the case at this point. Mike Check: Is The Use Of Mike Montgomery To Blame?